For one of our Oracle Fusion Middleware projects we had the requirement that the IT Ops activities should be scripted as much as possible. These activities included things like packaging, deploying, and automated testing of Service Bus projects, SOA Composites, and BPM processes. One of the more challenging tasks to script was to create and extract the runtime configuration of services deployed on Oracle Service Bus 11g using customization files. There seems to be no WLST feature readily available for this purpose. Based on some resources that all contained part of the solution, we were able to construct a WLST script for this purpose which you can find in this blog. This blog briefly explains the use of customization files, how to create a customization file using the Service Bus Console, includes the WLST script to execute this task, and provides a brief conclusion. Customization files are XML files that contain the configuration of Service Bus resources and projects. Examples of such configurations are Service URIs, JCA settings, Retry Settings, and so on. Customization files provide a convenient way to apply environment-specific configuration during deployment. You can both apply, as well as create and extract the runtime configuration of Service Bus resources and projects into customization files using the Service Bus Console. Read more about customization files in the Oracle Fusion Middleware Administrator's Guide for Oracle Service Bus. print "No project specified, exiting deployment"
print "No customization file specified, exiting"
print "Project " + projectName + " exported"
print "Cust file for " + projectName + " exported"
WLST provides a very powerful and comprehensive scripting environment for Oracle Fusion Middleware products. While most administration and management features can be accessed and executed through WLST, some of the features that are available through IDEs or consoles are not (easily) available through WLST and require a workaround or some research. One of these examples was shown in this blog. As most of you know, Oracle officially released SOA Suite 12c (12.1.3) and BPM Suite 12c (12.1.3) a couple of week ago. Exciting times for people like us, who have worked extensively with BPEL Process Manager, Oracle ESB, SOA Suite 10g, and SOA Suite 11g! The same week that 12c was released, eProseed World 2014 took place. During this event all eProseed employees meet for a fun couple of days full of social and work-related sessions. Because Vennster is merging into the eProseed Netherlands office we will soon migrate this blog to an eProseed domain. For us it was an excellent chance to meet all our new colleagues. In between the tour of Luxembourg city and an afternoon full of Highland Games (nobody got injured :-), multiple sessions where organized to present and discuss Oracle BPM and SOA 12c. The SOA Suite 12c presentation included an overview of 10 years of Oracle & SOA, new features and important themes in Oracle SOA Suite 12c, and information on the migration tool bundled with SOA Suite 12c to perform in-flight upgrade from 11g to 12c. Oracle User Messaging Service or UMS enables two-way communication between applications and users. There is support for a variety of messaging channels like email, IM, SMS and voice. Another option is to deliver messages to a user’s work list. With UMS messaging preferences users can define how and when they want to receive message notifications. They can define filter criteria to only receive messages they are interested in. Applications can send messages to a user respecting their preferences or send messages over a specific channel. In addition to the default channels, organisations can define custom channels using the Messaging Extension Driver. Messages for such channels are then delivered to a web service listener endpoint. This web service implements the actual delivery of the notification for that specific channel. To be able to use the web service in the Messaging Extension Driver of UMS it should implement the Messaging Notify Service WSDL. The content of this WSDL is listed in the Admin guide here. To quickly implement the service Message Notify Service interface I created a SOA composite that puts the contents of the notification message in a file using the File Adapter as illustrated above. By default an instance of the usermessagingdriver-extension application is deployed but not targeted to any servers. 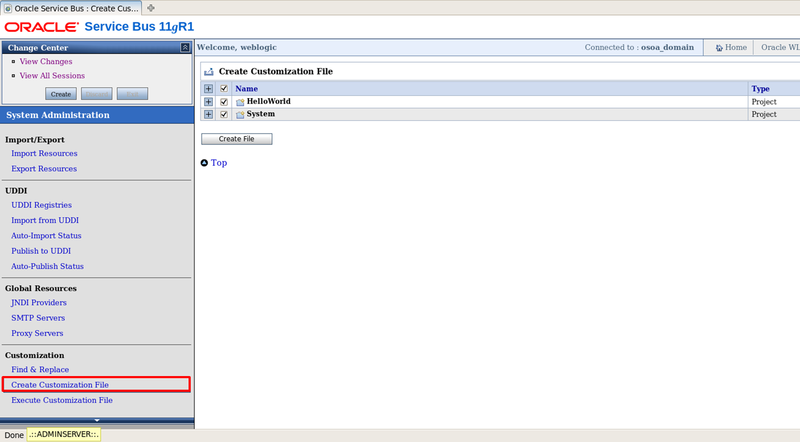 To enable the driver, use the Administration Console to target it to the servers where UMS is running. To configure the driver navigate to the usermessagingserver home page in the Enterprise Manager. Click User Messaging Service > Driver Properties. Select and Edit the driver usermessagingdriver-extension. To be able to receive messages over the custom channel, it must be added to your user’s messaging channels using the UMS preferences UI. The address is your unique user address for the custom channel similar to your email address. By setting the default property the channel will also be used to deliver messages that were sent to you based on user preferences. Notice the warning at the bottom of the popup. The Notification Service used by the BPEL User Notification activity and Human Workflow is based on UMS. Unfortunately this service only supports the default channels where the user's channel address like email or phone number is fixed to the information stored in the identity management system. To send messages with support for all channels UMS we have to use UMS directly using one of the multiple UMS APIs. These include an EJB API, a plain Java API and a Web Service API . In this example we will use the Web Service API as documented here. That's it! There should be a new instance of your Message Notify Service composite delivering the message to a file on your server. Now not only the custom channel is used to deliver the message but also the other channels marked as default like the email channel for example. Last week I visited Interaction ’14 which was held in Amsterdam. Interaction is the annual interaction design conference built around a global community. As User Experience Expert I attended several Computer Human Interaction conferences before, but never this one. And I must say it was a very inspirational experience. One of the key takeaways was that context influences perception. This was shown in the talk by Bernard Lahousse (Partner at Foodpairing.com). He stated that the perception of food changes by the context in which it is served. To prove this, he asked a volunteer on stage and let him rub a rough object and simultaneously taste a drink, a minute later this subject had to taste another drink while rubbing a soft stuffed animal. The subject stated that the 1st drink tasted sharp/bitter and the 2nd drink more creamy/sweet. In fact he drank the same drink twice. So a tactile context influences perception of food. The same goes for a bottle of wine you take home with you after a great holiday in Greece, because it tasted so well in a Greek tavern after a day of sunshine in Mediterranean air. Drinking the wine at home on a drizzling Saturday evening is perceived totally different. The message of this talk matches very well with the talk by By Thomas Küber (Design lead at Groupon) and Christian Drehkopf (User Experience Evangelist and Mentor) in which they stated that we, as interaction designers, should not design for devices but “we should deliver experiences that create superb value for the users in their personal situation/context”. In order to inspire users to use the applications or products we design, we have to motivate users and make them curious. At Interaction ’14 there were 2 talks which gave some insight in how to do this. There was Ellis Bartholomeus (Game- & Design consultant). She explained that motivation can be designed via play. To play you need a game (= the definition of the rules and goals) and a player (= the person interacting). To motivate the player to play the game, the player needs to feel safe and trust the game. The game should be hard to play, but not too hard. If the player barely completed the level, he will be curious about himself in the next level and be very loyal to play it again. A player will be motivated by a game if it contains wonderment, engagement, frustration, reward, surprise, irritation, freedom competence and joy. introducing information that is possessed by others. However, the user should always be in control. “If we take control of the user, we kill curiosity” says Huisman. I attended two talks pleading that good user experience design always involves a team. Tash Wong (independent product designer) talked about Onlyness by which she means the fact that “we all have our own perspective and own unique feminine or masculine point of view from which we design. We are social engineers that design for behavior and communication.” To be able to design products/applications for others we need empathy and look at things from different points of view. Tash Wong developed a method containing a set of 16 cards which is designed to help UX designers better articulate their perspectives and priorities. The cards can be used to communicate the direction for a project, figure out why we do, what we do, or generate new ideas and then ‘Think Bigger to Make Better’. At Vennster we already work like this and from experience I can tell that it works. Last week I have been listening to many experts in the field of interaction design and I gained a lot of inspiration which I definitely can use in the projects I’m currently working on as a User Experience Consultant for Vennster and in the ones I will be working on in the future.